Stand Up Paddle Surfing: Punta Abreojos Volunteer Lifeguard Training: Donate to a Great Cause! 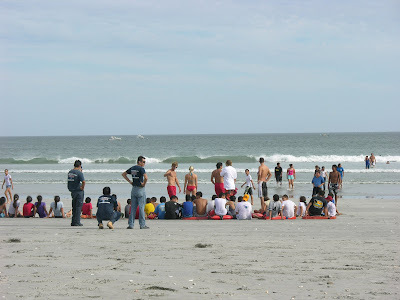 Punta Abreojos Volunteer Lifeguard Training: Donate to a Great Cause! Here's your chance to do something really cool. The life guard associations of Imperial Beach and the Silver Strand get together every year to donate their time to building a Volunteer Lifeguard Program down in Southern Baja at Punta Abreojos. Abre's in one of the sweetest point breaks around and it's a great place to do stand up paddling. My brother and I stopped in two summers ago and had a great time surf paddling and exploring the giant estuaries to the north and south. The point breaks and beach breaks can be hazardous for the people of Punta Abreojos, particularly during the south swell season when long lines wrap in creating big rips and deep inshore holes. 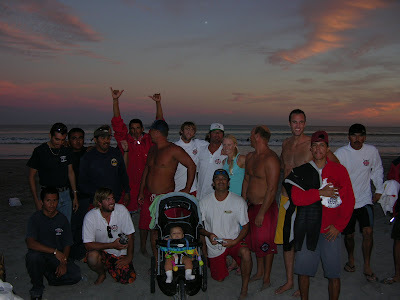 You can help by the program by donating money to the Imperial Beach Lifeguard Association. Mike Pilgrim, the Treasurer of the Association, told me that the money will be used to cover travel expenses for the lifeguards who are driving down to Abre. "We are currently planning our 3rd annual lifeguard training session with the community of Punta Abreojos. 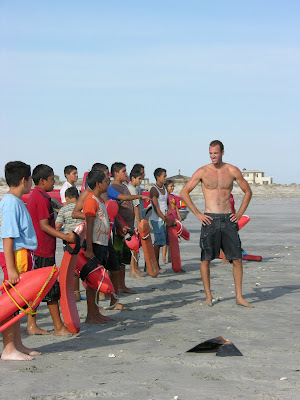 During the program's first two years, volunteer lifeguards from Imperial Beach, San Diego, and Silver Strand have succesfully organized and trained a core group of senior volunteer lifeguards for the community of Punta Abreojos, and have "drown-proofed" 113 school age children. Next year we plan to "go pro," initial contact has been made with a number of philanthropic foundations interested in funding the Punta Abreojos Lifeguard Service during summer 2009." Want to learn how to stand up paddle? Give us a call at 619.213.6622 or email john@paddlesurf.net and will get you out and ON IT! First off, I just want to thank John for putting this up! The Abre trip is one of are most succesful missions put on. Aaron Quintanar is the man behind this mission! Without Aaron, none of this would exist. Below is a link to a story in the UT about a hand full of us heading down to Mexico to help a fellow person in public safety find his son. Your donations help volunteers make these missions possible! Also, you donation is tax deductible, The Imperial Beach Lifeguard Assocation is a Non Profit Corporation created to promote ocean safety, not only in IB, but in Mexico as well. Please make checks or money orders out to the IBLA.